The perfect A-10 Warthog sound effects library for game developers with detailed instructions on how to use it. For the library we used real field recordings of A-10 with General Electric TF34-GE-100 turbofan engines. 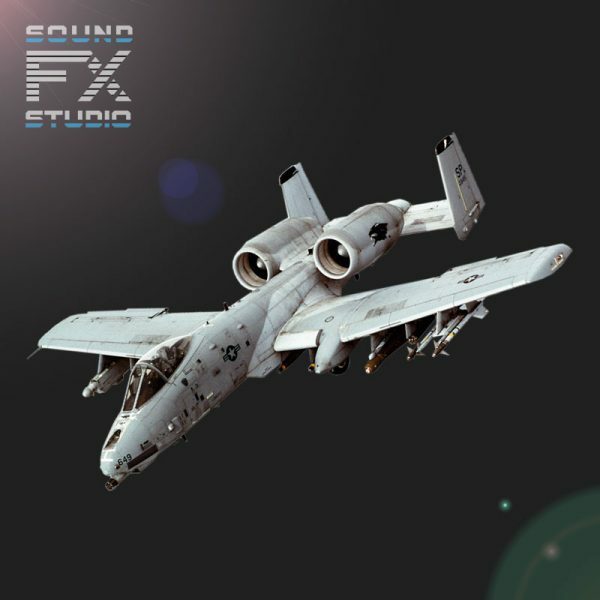 The A-10 Warthog SFX sound library includes 12 seamless loops and 8 special sound effects. Use them together, make your A-10 real. Commonly referred to by the nicknames “Warthog” or “Hog”, its official name – The Fairchild Republic A-10 Thunderbolt II – comes from the Republic P-47 Thunderbolt, a World War II fighter-bomber effective at attacking ground targets. The primary integral weapon of the A-10 Warthog is a nose-mounted 30mm GAU-A8 Avenger Gatling-type Autocannon. With multiple hardpoints, the A-10 Warthog can be equipped with everything from bombs to mines to missiles of various sorts. All of our jets are based on the same implementation principle with the same functions. Therefore, when you configure A-10 for your project, you can easily use other jets from soundfx.studio.